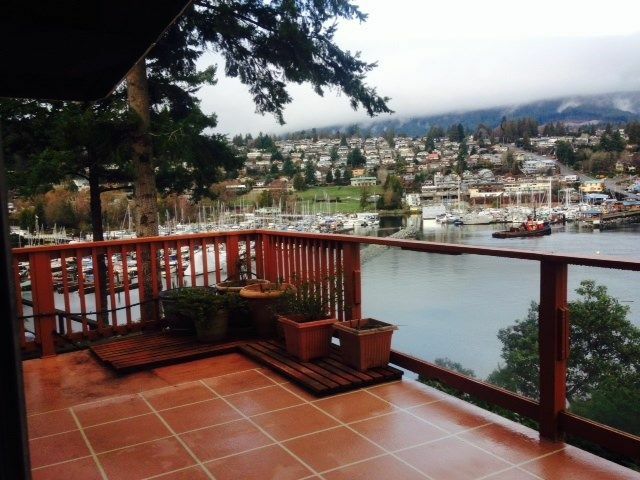 Fantastic location "Gibsons Bluff" WATERFRONT home overlooks Howe Sound, sweeping views of Harbour, Marina, colourful coastline activity! This custom built home, first time on the market, enjoys open plan with vaulted ceilings, gas fireplace in living room. 2 bedrooms on main, plus 1 to 2 bedrooms down with big family room, with gas f/s stove. Both levels open to large sundecks. Lower level ideal guest accommodation potential. Easy walk to marina, stores, galleries, restaurants! you won't need a car if you live here! Ideal vacation home or full time residence. When you live here, you'll never want to leave - bring your update ideas - this home is worth it! The sky's the limit.